Gym clothes to support that new year you! The best gym gear for the best you! Yes it's sale time again and the post Christmas price slashing is in full swing. It's not all DIY and sofas, the fashion industry is on it too and what better time to take advantage and update your fitness finesse. 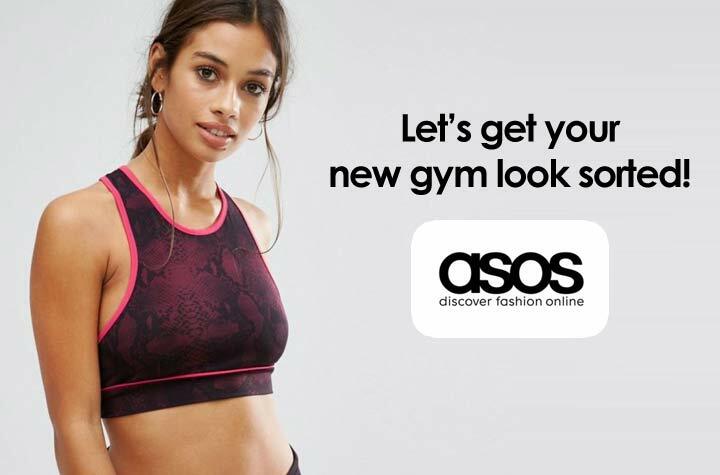 Our friends at ASOS have, as usual, got us covered with not just ordinary gym gear but also pieces from their tall, petite, curvy and maternity ranges. You need to act fast though to grab a bargain. Here at London Fashion Blog we suggest you take a few minutes to think about what you really need. It's easy to get swept up in what looks good but if you’re working out you need your clothes to not just look great but suit your activity too. Different types of activity need different types of clothing. A highly beneficial but lower impact activity like yoga or Pilates will require comfortable stretchy clothing that's not going to ride up and be uncomfortable. For a more intense class such as spinning you will need bottoms that won't flap around your ankles and possibly get caught in machinery. There are hundreds of different classes to try and an intense workout like bounce dance fit or insanity will need flexible supportive clothing. This way you can move freely without being restricted by tight clothes or flashing the other fitness buffs. A great sports bra is essential, as high impact movement can cause damage to breast tissue and be painful. This is especially true if you are blessed with a larger bust but is certainly not a reason for avoiding exercise. There are some great sports bras out there from specialist brands like Shock Absorber and Nike which will give you great support where you need it the most. However if you feel this is not enough some gym tops have added bust support or some women wear two sports bras, one over the other. Whatever you choose make sure it's comfortable when you move around and supports you without being restrictive. So now your looking at the gear why not try something new for 2018? If you’re a social butterfly then why not try a team sport, look for local football, netball or rugby clubs. If you want some fun with friends then why not get together for a game of badminton, tennis or squash. There are loads of different classes to try based around anything that takes your fancy, dance, boxing, aerobics or yoga. Climbing walls can be a great thrill and lead to all sorts of adventures or perhaps just a jog round the bock with a friend, on your own or with the dog. So now you look the part, grab your water bottle and get active. Regular exercise is great for your mental as well as physical health. It can boost your mood and you can make it as social (or anti-social) as you like. Looking good while you get sweaty is just part of it, so why not make a new fun exercise regime a habit to continue throughout 2018 and not just part of January's abstinence. Enjoy the New Year fitter and healthier.